Measuring out a roof can be very confusing. A roof is measured in "squares" when estimating how much material is needed, where 100 square feet is equal to one roofing square. An area measuring 10 by 10 feet equals one roofing square. To get an accurate measurement of your roof you should always draw a rough sketch first. Break up each area into rectangles and triangles. You will have some rectangular areas containing hips or valleys which form the triangles. You will need to use this basic geometry equation of a triangle to calculate the number of squares on your roof. The base length (b) times the height (h) of any triangle is twice its area (A). Divide the product of the base and height by two to get the area of a triangle. Calculate each rectangular and triangular section individually and add them all together to get the total number of squares of your roof. With a tape measure, a pencil and paper you can calculate the square footage of your roof. 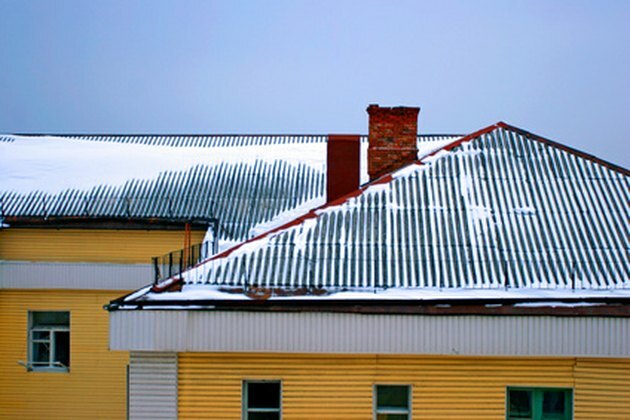 Draw a rough sketch of your roof. Draw every eave, valley, rake, hip and ridge. Draw every rectangle and triangle. Number each section of the drawing. Measure the length of the eave or ridge in sections shaped like a triangle. Measure the perpendicular line from the peak to the eave or ridge. Multiply the length by the perpendicular line. Divide the total by two. The result is the number of square feet in this section. Write the total in this section of the roof sketch. Use this procedure for triangular sections of the roof. Divide up sections that have a rectangular eave or ridge with a hip or valley on the end to form a triangle. Measure the length of the rectangular section. Start from the beginning of the rectangle and measure to the point where the triangular begins. This is the length of the eave or ridge. Write the measurement down. Measure the length of the eave or ridge which forms the triangular end. Begin the measurement where the measurement for the rectangle ended and the triangle begins. Measure out to the end of the the hip or valley which forms the point of the triangle. Measure the perpendicular line from top to bottom which forms the hip or valley. Multiply the length of the triangle by the perpendicular line. Divide by two. To obtain the total square footage of this type of area multiply the measurement for the length of the first rectangular section by the length of the perpendicular line. Write this total down. Multiply the length of the triangle by the length of the perpendicular line and divide by two. Write this total down. Add these two totals together to get the total square footage of this section of the roof. Measure the lengths of two adjoining sides on all rectangular sections and multiply the two lengths to get the area of those sections. (Unlike with triangular sections, you don't need to divide the result by two.) For rectangular sections that are perfect squares, just measure one side and square it to get the area. Make sure to add any hip or valley measurements to this number. The result is the square footage of the total area. Write the number down on the sketch. Repeat this process until you have covered every area on the rough sketch. Double check your sketch to ensure that every area has been measured. Add the sum of all the measurements. Divide the total number of square feet by 100 to get the number of roofing squares of the home. For example 5000 square feet divided by 100 equals 50 roofing squares.